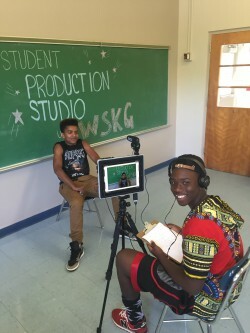 In partnership with Union-Endicott School District, the Student Production Studio with WSKG has opened in Linnaeus W. West as part of the Tiger Ventures program. The studio is located in the business incubator wing and is staffed by Annie Cartie, Youth Media Coordinator, for two days each week. Youth media programming at WSKG takes outreach education to a new level for the 2016 – 2017 school year. Students will learn video and audio production, digital editing, graphic design, photography, and professional uses of social media. Production projects will align with curriculum topics taught in core classes and, as students build their skill sets, they will produce projects they design themselves. Their first undertaking: Produce a video to show the community what Tiger Ventures is all about! Eight students, three teachers, and WSKG’s coordinator worked collaboratively to produce this video in six days. Latrell Sellers and Basheem Smalls, Grade 9, interview each other as they learn how to use Padcaster equipment. WSKG Youth is excited to work with Union-Endicott students and staff this school year, and we look forward to sharing student work with our community! If you are interested in supporting the Student Production Studio with WSKG, please contact Shannon Hanrahan at (607) 729-0100 x334 or donate online. Direct your donation toward this youth media project with a note in the ‘comments’ box. Thank you!